The seasons generally influence the food offered. During summer and autumn markets overflow with fresh vegetables and fruits coming from the local farms. Radishes, spring onions, potatoes, nettles, spinach, lettuce, tomatoes and cucumbers delight the shoppers in April and May. From the end of May to late September there is a large variety of fruit: cherries, apricots, strawberries, raspberries, plums, pears, melons and watermelons, peaches, blackberries, blueberries, apples, grapes, quinces and nuts. Beekeeping has always been one of the traditional occupations in Romania, and the products (honey, wax, honeycombs) are also sold on the market. The best-known dish is sarmale, called also with the diminutive sărmăluţe, (mincemeat wrapped in cabbage or vine leaves) with mămăligă (polenta). Stews (tocăniţe) made with different kinds of meat (usually chicken and pork) and with vegetables also figure on the restaurant menus, as well as different kinds of soups. Ciorbă de burtă (tripe soup) served with garlic or hot chilli pepper and vinegar is one of the favourites among Romanians. Pork prepared in different ways is one of the most common ingredients, and all restaurants serve pork chops (cotlet) with French fries and salad. There are not very many dishes for vegetarians, as Romanians consider a meal without meat very poor indeed. Some dishes are ghiveci (mixed fried vegetables), ardei umpluţi (stuffed peppers, although these might have meat, too) and ouă umplute (filled eggs), besides different kinds of salads and local cheese. At home, the peasants’ meal almost always contains polenta (mămăligă) that is also known as the “bread of the peasant”. Some centuries ago, when Romania was strictly divided into two social groups, the boyars and the peasants, bread was only eaten by the boyars. Nowadays the situation is different and mămăligă is the traditional dish for everyone, although in towns it is not eaten daily as in the countryside. 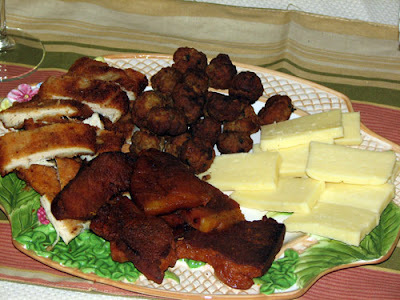 A traditional combination on farms is mămăligă and smoked pork fat called slănină with garlic, chased with a small glass of ţuică. A dish associated with the life of shepherds on the hills is mămăligă with sheep-milk cheese. 1 large soured cabbage, 1 3/4 lb/750 g ground meat (mixture of pork and beef is recommended), 2 large onions, 2 tablespoons rice, 2 tomatoes or 500 mL tomato sauce, salt, pepper, sweet paprika and sour cream (optional). Grind the meat with a raw onion. Place in a bowl and mix with rice, pepper, salt, paprika, and finely chopped onion. Mix everything well. Core the cabbage with a sharp thin knife. Carefully remove the cabbage leaves, one by one, so that they do not tear. Cut larger leaves in 2 or 3 and then place a little meat in each cabbage piece and roll in. The smaller the rolls are, the tastier they are. Place a layer of rolls in the pan (take a deep one), then cover with a layer of chopped (julienned) cabbage and the bay leafs, then a layer of thinly sliced tomatoes. Do this layering until all the rolls are made. The last layer must be tomato slices and add tomato sauce. Then place in the oven so that the liquid is reduced. Serve hot with sour cream. * When soured cabbage is not available, use cabbage leaves scalded in water. 1 qt. Water, 1-2 cups corn meal, 2 tsp. salt. Boil water and salt in a pot. When water is boiling, gradually add corn meal while stirring the mixture with a whisk. Stop adding corn meal when the mixture is considerably thick, though still liquid. Continue to simmer for about 10-15 minutes, with caution since the mixture bubbles up and splatters hot polenta around. Remove from the heat and serve hot with your favorite dish.